The oldest known surviving B-25. This website is built and maintained by the B-25 History Project. We are dedicated "To preserve and honor the history of the B-25 "Mitchell" bomber and the men and women who built, flew, and maintain them; past, present and future". 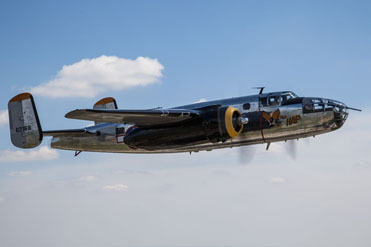 Along with honoring and preserving the history of the B-25 we will help ensure its survival. Our plan is to highlight the entire history of the B-25 from its origins through today with a focus on the Fairfax, Kansas plant. Producing 6,680 of the 9,889 aircraft, the Fairfax plant built most of the B-25s currently flying worldwide. This information is proudly brought to you by some of the most respected and knowledgeable B-25 and Fairfax plant historians around. We are now 501(c)3 not-for-profit organization. As a not for profit organization, we cannot profit on our endeavors. Every person connected to this project is a volunteer. I am proud to say 100% of what we do goes to the men and women who truly deserve it. We are all honored to tell the story of the great men and women who built one of the greatest bombers of World War II. We are so humbled that we have grown so much in such a short period of time. We cannot thank those who have been involved in our success enough. We would like to thank every person that visits this website. We simply would not be here without your help. The B-25 History project was founded on the idea of collectively sharing resources and knowledge to a common goal. We are teaming up with museums, historians, and organizations to bring the most comprehensive understanding of the history of the B-25 bomber to life. Our goal is to inspire and educate the next generation to continue our work preserving and honoring that history. Website: Still under development, this website is our current voice to the world. Planned as the single most comprehensive resource for information on the history of the B-25, we are diligently researching two main aspects of B-25 History. The first is our section of Airframe Biographies. We have been expanding this continually since this first site went live. The team has settled on a final format for the pages, and over the next several months we will update the existing pages and continue loading new bios. The second aspect is the personal stories behind the history of the B-25. Our connection to the men and women who built B-25s in Kansas City gives us a unique perspective on that history. We feel this is an important story to tell. Project X and Project Y: We are always looking to the future. As such, we are in the preliminary stages of two separate projects of great importance to our mission. Project X will be a long term project that is the most expensive project we have considered. Check back here for more information on these two projects in the coming months. In my experiences, I have come across many kinds of people. The two types of people that really stand out are the "Dreamers" and the "Doers". The dreamers always have a vision. The doers are willing to get it done. I admire both of these personality types. As George Bauer once wrote: "The skeptics may slow progress, but the dreamer who also becomes a doer will always win.". In my opinion, every one of the people working on this project are both dreamers and doers.